Ben Earb Ridge Walk, Spittal of Glenshee, Meall a'Choire Bhuidhe, Glen Lochsie, Allt Clais Mhor. 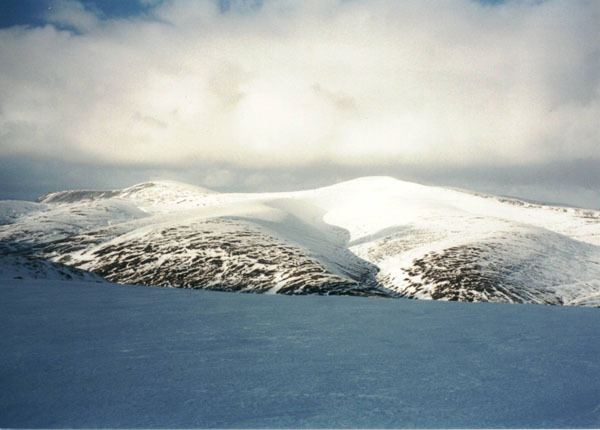 The Ben Earb ridge stretches north west from the Spittal of Glenshee and offers a fine upland walk with stunning views east and west. The climb up on to Ben Earb is hard work if you're more used to low level walks, but as you stand by the trig point all the effort is rewarded with spectacular panoramas. The rounded summit of Meall a'Choire Bhuidhe follows and as you wander over the flanks keep your eyes open for deer and hares which frequent the mountains and glens here. The tops, ranging in height from 801m to 868m, are too low to be Munros and don't even rank a mention in the table of Corbetts. But that in no way spoils the enjoyment. For this is a fine day out in the hills. A public right of way sign for 'Enochdhu' on the road by the bridge next to the Spittal Hotel marks the start of this walk. Pass through a gate and head up the slope on a good path keeping the wall to your right. The way climbs alongside the burn to a wooden step stile. Cross and a grassy path strikes away from the wall towards an obvious track on the hillside ahead. 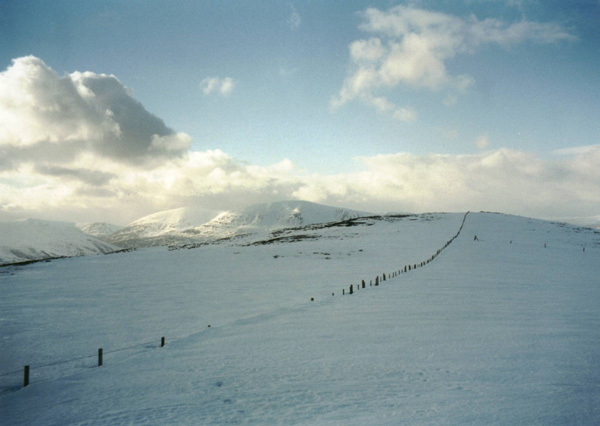 Continue up this to the col at An Lairig a kilometre on. Don't cross the fence here but turn right and head out over the open hillside, following the line of the fence and keeping it to your left. 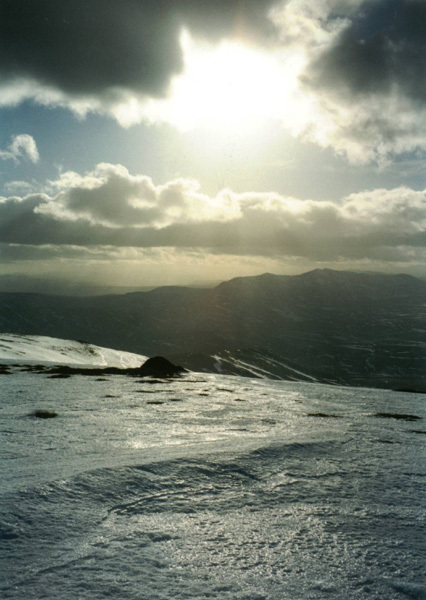 The slope is initially fairly steep in places but eases off before dipping into a col. The final ascent of Ben Earb starts here. Stay with the fence and climb a little over 150 metres to the trig point which is surrounded by a low stone shelter. Descend along the fence into another col and then begin the climb on to Meall a' Choire Bhuidhe. This is a longer, more gentle slope and the summit, when it finally comes, is marked by a cairn, located a few yards from the fence. Descend north west, staying to the left of a forestry plantation and the slope gently descends into Glen Lochsie, picking up a small stream. Keep the burn to your right and go down towards its junction with the Glen Lochsie Burn at grid ref 053729. You will be able to cross the burn on rocks just downstream of this. Head east up over the heather to meet a wide track above Glenlochsie Lodge and follow this down to the shooting lodge. Behind the ruin, a small path runs up to a rustic little bridge over the Allt Clais Mhor. Cross and the path continues to the trackbed of an old narrow gauge railway that once ran up the glen ferrying stalkers to the lodge from Dalmunzie House below. Hidden in the grass and heather there is a quaint little platform at the terminus of the line and a rickety old bridge provides a precarious crossing over the Allt Clais Mhor. The railway was used to transport the laird and his guests up the glen from Dalmunzie House to Glenlochsie Lodge. Two 20hp petrol powered engines were employed. The first, named 'Dalmunzie', entered service in 1920 and she was joined by 'Glenlochsie', an identical vehicle, the following year. Tales abound of the rollercoaster ride they provided on the downhill run. The line closed in 1978 but the nameplates of the two locomotives are to be found in the hotel. Follow the trackbed down Glen Lochsie. It passes below Glenlochsie Farm and runs on to the edge of forestry behind Dalmunzie House. Don't enter the trees but cross over a small patch of field to a tarmac road to your left beyond a wooden gate. Follow the road past the house and then on to Spittal of Glenshee. Start/parking Layby at Spittal of Glenshee (grid ref NO 109699). Grading Path initially but then open grass and heather hillside with a fence to keep you on the right course. Returning over trackbed of former railway line and estate track. Suitable for fit walkers and older children. Upland walk. Sheep grazing in places so dogs on the lead.